I picked up a couple of bunches of rich, purple kale to contrast the yellow and orange flowers. This dish would be the perfect addition to any dinner party It’s colorful, light, healthy, and vibrant. You will dazzle your guests with your culinary and artistic talents! I really love massaging kale. Like, probably more than I should. But whatever, rubbing the oil and a bit of sea salt into the kale with your hands cuts down on the bitterness and makes it taste really good. So get to rubbing that kale! Wash the kale, then remove the stems and tear it into bite sized pieces. In a large bowl, pour the olive oil over the kale. Add a dash of sea salt then massage the oil in with your fingers. This will cut down on the bitterness and the amount of dressing you need. Cut the onion and the persimmon into thin slices. Mix the onion into the kale, toss with your hands. 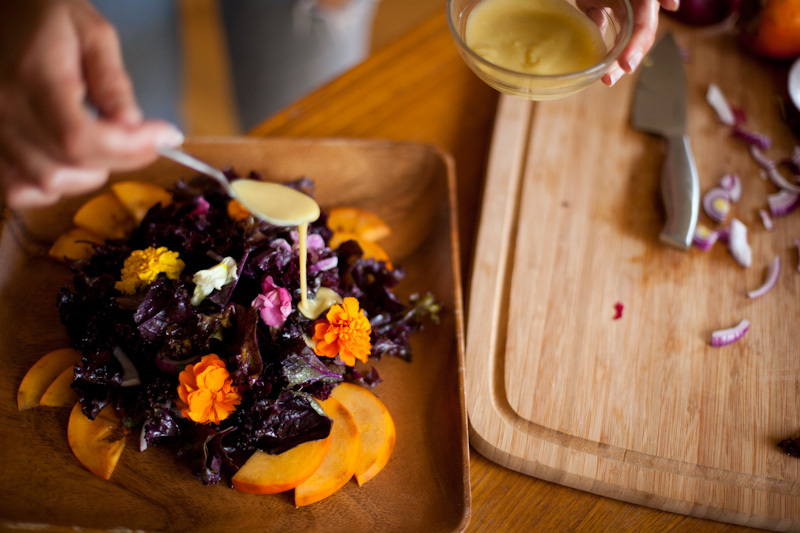 Divide the mixture onto serving plates, then arrange the persimmon and flowers on top of the salad however you like. Drizzle 1-2 tbs of Champagne Dressing on top of your Flower Power Purple Kale Salad, then take a moment to admire this gorgeous creation. You deserve it! I also love your sweater. That is one beautiful salad!! !